Playing jazz, pop, world, cabaret, film scores and folk, the Metropole Orkest have shared the stage with legends such as Ella Fitzgerald, Dizzy Gillespie, Brian Eno, Pat Metheny, Stan Getz, Bono and Steve Vai. The Metropole Orkest invest just as much in playing with the next generation of stars, like Antony and the Johnsons, Snarky Puppy, Laura Mvula and Gregory Porter. 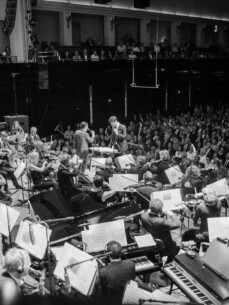 The Metropole Orkest is a regular guest on The Netherlands’ main stages such as the Amsterdam Paradiso and has played both the Barbican and the Royal Albert Hall in London. The Orkest also play many festivals including North Sea Jazz, Holland Festival, Pinkpop, Lowlands and the 3FM awards, BBC Proms and Musikfest Bremen to name but a few. The Metropole Orkest has produced more than 150 albums and thousands of radio and television broadcasts, requiring over 600 arrangements per year in every imaginable style. Despite this musical versatility, people all over the world can recognise inimitable sound, style and identity of the Metropole Orkest.